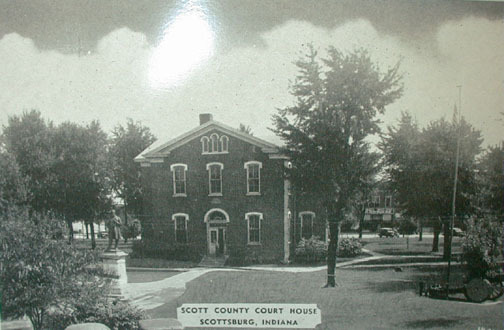 In June 1996, a group of genealogists organized the Indiana Comprehensive Genealogy Database. The idea was to provide a single entry point for all counties in Indiana, where collected databases would be stored. In addition, the databases would be indexed and cross-linked, so that even if an individual were found in more than one county, they could be located in the index. At the same time, volunteers were found who were willing to coordinate the collection of databases and generally oversee the contents of the web page. My name is Pat Mount and I am the person responsible for Scott County. If you would like to contribute your information to this page, please let me know. I have set up the Rootsweb Message Board for Scott County. You may post information to the appropriate category. If the information is not applicable to posting on a message board please contact me.If you would like to host a county, contact Denise Wells, our state coordinator. Photographs and other content on these pages are intended for the private, non-commercial use of the general public. Copying them for private use is authorized, however republishing any of the content of this site is prohibited without prior written permission. Copyrights are held by the originators/contributors of the content, and are provided here as a courtesy.